New for 2010/11 is a weekly column by Yankee Gunner. If you don't already read his blog or follow him on twitter, I'd recommend you do. I'd like to welcome him to AshburtonGrove and here is his wonderful first piece. As a married man I can tell you that marriage is not exactly what I expected. It’s not always a state of bliss. It’s not constant euphoria knowing that you’ve found your soulmate and get to spend the rest of your life with them. Sometimes it’s hard work. Sometimes you’re wildly in love with your spouse. Sometimes you’re less in love with them. Sometimes you leave the toilet seat up. Those are bad days. Supporting Arsenal is a lot like a marriage. I know I will support the club for the rest of my life, but that doesn’t mean it’s always easy to love them. Let’s face it, it’s hard to love a team that consistently demonstrates a lack of character. I think we can all identify with the youtube video of Dan Compton losing the plot during last season’s draw at Newcastle. That’s because the video is emblematic of the problem with this team. Often it feels like the games mean more to the supporters than they do to the players. It’s hard to devote yourself to a team that seems unwilling or unable to commit themselves to the cause. As a result, I’ve spent much of the last few seasons rooting for Arsenal, without completely loving the team on the pitch. If there’s one thing that has really frustrated me about Arsenal in recent seasons, it’s their incredible capacity to choke under pressure. They’ve thrown away leads that seemed insurmountable and found unique ways to push the self-destruct button. Meanwhile, without a hint of irony in his voice, the manager has been telling anyone who will listen that his team possesses tremendous mental-strength, while his players have seemed determined to prove him wrong. And all the while, what rankled most of all, was the seeming lack of passion and commitment within the side. Yes the players were all very nice and chummy with one another. But with few exceptions, it seemed that they were more concerned with calling themselves winners than playing like ones. Last night against Udinese, that seemed to change. This wasn’t the team I’d watched casually stroll the pitch in previous matches. This wasn’t a group of xbox-playing friends killing time on a Wednesday night. And this wasn’t a team of cowards or chokers. The Arsenal team that qualified for the Champions League last night was a collection of proud warriors who fought for the badge on their chest more than the name on their back. Under the circumstances, you could almost have forgiven Arsenal for capitulating to their Italian opposition. Yet another big name player had left the club just before kick-off. There were injuries aplenty. And the starting XI was littered with teenagers short on experience. Considering the immense pressure and the general sense of doom surrounding the club, it wouldn’t have surprised me if Arsenal were eliminated. But when this group of players had their backs to the wall, they showed the courage and solidarity that’s so often been missing in seasons past. You can see the difference in this team all over the pitch. But nowhere is it more evident than in goal. Even this summer, pundits questioned when we would add experience at ‘keeper. But now we have a young Pole who looked more relaxed in Arsenal’s goal than I was in front of my television. His penalty save was the stuff of legends. If this game had happened last season, the story of the match would’ve been about how an unjust penalty decision sent us crashing out of the Champions League. But today we won’t even have to debate that awful decision, because Szczesny mooted it with his brilliance. Last season at this time, we were treated to the comedy stylings of Manuel Almunia. He made us a laughing stock. But with Szczesny in goal, no one is laughing anymore. I think you’ll also find that he cost a little less than United’s wunderkind De Gea. Last season, Gael Clichy and Emmanuel Eboue were busy playing people onside and giving away stupid penalties. Regardless of the fact that they cost us matches, their “exodus” was supposed to be evidence of our decline. On Wednesday night, we handed a start to a 19-year-old right-back who was playing non-league football six months ago. That should’ve been a sign of our weakness. But this 19-year-old boy is a gooner. He was raised to love the Arsenal. He was prepared to run until his legs gave out if that’s what it took to win this match. And that’s exactly what he did. Carl Jenkinson was one of only five players in the entire match to cover over 10 kilometers during the 90 minutes. He never switched off. He never lost focus. He was even calm with the ball at his feet, deep in his own half. Gael Clichy could’ve learned a thing or two from watching him last night. Arsene Wenger often gets criticized for comments he makes in press conferences. There may be no Wengerism more ridiculed than his infamous “like a new signing.” But maybe he’s got a point. Watching Thomas Vermaelen last night was like watching a new signing. It was as though Wenger had splashed the cash on the center-back we’ve been crying out for him to sign. Vermaelen was confident, self-assured, and never quit. He dominated on set-pieces, turning Arsenal’s achilles heel into our strength. After the match, Wenger admitted that Vermaelen wanted to come off in the second half. But he didn’t come off. He didn’t force the manager to put Miquel in the match with no margin for error. He stayed on the pitch and battled for his teammates. I can think of more than a few former Arsenal players who wouldn’t have shown such determination. Midfield was supposed to be a problem area for Arsenal last night. An out-of-form Aaron Ramsey partnered Alex Song and a callow teenager with a mohawk. But Aaron Ramsey did something special. He lifted his game for the big occasion. He covered more ground than any other Arsenal player and completed the highest percentage of his passes. He didn’t make the glamorous plays, but he worked hard at both ends of the pitch and kept possession well. This was the area where we were supposed to rue the losses of Nasri and Fabregas. But neither erstwhile gunner was missed. Ramsey did what was needed, and he didn’t back-heel the ball to the opponent on the edge of his own area either. Then there’s the trio of attackers that got us the goals we desperately needed. Captain Robin van Persie opened his account with the goal that sent us through. Is there a better way to lead your team than getting a crucial goal when it matters most? That’s what Robin did for us in Udine. Theo Walcott got us the goal that killed off the tie. He’s a player that has grown up with Arsenal and taken more abuse from the media than he can possibly deserve. Walcott is the quintessential “nice guy” who stereotypically finishes last. When he missed a gilt-edge chance early in the match, there was a possibility that he would be painted as the goat. But he didn’t go missing. He didn’t hide from responsibility. Samir Nasri played half of last season as an invisible man on the flank. Theo Walcott kept working and was rewarded with a wonderful solo goal. Finally, there’s Gervinho. He cost half of what Liverpool paid for Stuart Downing. He cost a fraction of what City paid for Nasri. But he gets past defenders every time he touches the ball. He can dribble every bit as well as Nasri but has the unselfishness to keep looking for his teammates. And his engine is fantastic. 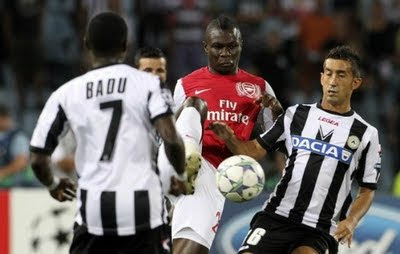 The Ivorian never looked tired despite running the Udinese back line ragged. He should’ve had a couple of assists last night, but it was his solo run and cut-back for Van Persie that put us into today’s group stage draw. The last few seasons we’ve watch the Arsenal attack slow to a pace would make a snail impatient. With Gervinho in the side, we have our dynamism back. Maybe the most impressive performance of all came from our beleaguered, battered, brilliant manager. Arsene Wenger picked the right players last night. He didn’t show favoritism or emotion. He didn’t play Traore just because he was fit. He stuck with Jenkinson. He didn’t start Arshavin for his experience over the harder-working, more dynamic Gervinho. He left Vermaelen on the pitch to battle through injury. He wasn’t afraid to play two holding midfielders when we needed to protect an advantage. But then, when the change needed to be made, he didn’t hesitate. In the past, we’ve seen Arsene Wenger wait until it was too late to make his changes. On Wednesday, he needed only 45 minutes. And the decision to bring on Tomas Rosicky won us the match. Many supporters dismissed these comments as paying lip-service to the need for more signings. And while there is still work to be done, last night Gervinho and Jenkinson showed that Wenger was right to believe in their quality. But what will please Arsene most of all, is that his team finally showed the “mental strength” he’s been talking about. They didn’t make him look like a fool. And now that Arsenal are back in the group stages of the Champions League for the 14th consecutive year, the media will be forced to concede that we are still an ambitious club. It’s easy to say that these feelings are only based on one win. Maybe that’s fair. But even as I watched a woefully understrength, 10-man Arsenal side lose at home to Liverpool on Saturday, I found myself applauding their effort. It was hard to find fault with them on that day. Compare that with embarrassing efforts in last season’s losses at home to Newcastle and WBA. The difference is obvious. This group seems prepared for the battle. That doesn’t mean they’re always going to win, but it undoubtedly makes it more enjoyable to cheer them on. I don’t know if this Arsenal team is going to win trophies. We are still very young and still need to add players to the squad. But what I do know, is that I like this Arsenal team a lot. I like their fight and their spirit. I like their passion and love for the club. Just reading Jack Wilshere’s tweets today made me swell with Arsenal pride. That’s exactly what I saw on Wednesday night. Gone was the laughable goal-keeping, the frailty on set-pieces, the ill-timed loss of concentration, and the excuse-making. Gone were the bottlers, the chokers, the passengers and the fools. Gone was the awful feeling in my stomach that I resented the very team I support. Instead I saw a team under immense pressure stand up and be counted. I saw a team of courageous, proud and committed young men fight for their football club and emerge victorious. And as I watched those men give everything they had for Arsenal, I could feel a wonderful sensation rushing over me. It was like falling in love all over again. Yankee Gunner blogs at Yankee Gunner Blog - a site for all Gooners. You can follow him on twitter and his read is work at Yankee Gunner Blog.